Agilent Technologies Inc. (NYSE: A) today introduced two new test applications that leverage the high bandwidth and low jitter performance of the Infiniium 86100D DCA-X oscilloscope. 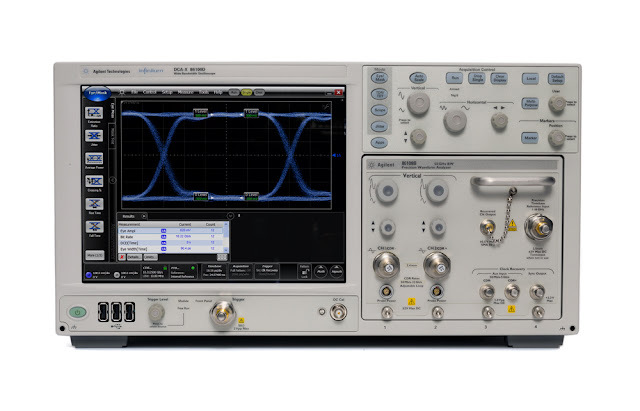 Agilent N1012A compliance test software is the industry's first automated application for the Optical Internetworking Forum's Common Electrical Interface (OIF CEI) 3.0 Implementation Agreement. Agilent N1019A user-defined application, on the other hand, enables engineers to rapidly develop their own automated test applications. Both software packages help developers save time and money. For additional information about Agilent's N1012A compliance test software, see www.agilent.com/find/N1012A. Information on Agilent's N1019A user-defined application is available at www.agilent.com/find/N1019A. Images are available at www.agilent.com/find/OIFCEI_images. Agilent's complete portfolio of oscilloscopes is available in a variety of form factors, from 20 MHz to more than 90 GHz. They offer industry-leading specifications and powerful applications. Agilent N1012A compliance test software is priced at $9,500, and the N1019A user-defined application is priced at $3,570. Both will be available for order starting July 1. Free trial downloads of both applications are available from the Agilent website. The Optical Internetworking Forum has many industry participants that jointly develop implementation agreements for high-speed serial interfaces. The OIF also hosts a series of technical workshops, booths at trade shows and interoperability sessions. OIF's current directors are employed by the following OIF member companies: Alcatel-Lucent, AT&T, Ciena, Ericsson, Finisar, Nokia Systems Networks, and Verizon. More information about the OIF and its membership benefits is available at www.oiforum.com or by calling +1 510 492 4040.